Okay, here we go. The home stretch. There are nineteen grueling car-related entries to discuss, and then we close the book with a short "miscellaneous fun stuff" chapter that reprises Part 1. "The idea of a collision-avoidance system is something that's bounced around [ha? -LR] the auto industry for years. After all, planes and boats use radar to avoid collisions. Why not cars?" Maybe because, as Future Stuff goes on to say, "automobiles...travel so close together, there's little time to react once you're alerted to danger." But nitpicking the old standbys of futurism never brought that Beautiful Tomorrow any closer, so let's dig in. "[T]he Nissan Motor Company of Japan is working on a system" that uses a "pulsating laser beam", radar-style, to detect oncoming collisions. "[I]f you're about to hit something or someone, it will slam on the brakes." My preferred technique is to use a "pulsating laser beam" to vaporize all other cars on the road, but the insurance premiums get expensive, so I can see how you might do it the other way. I'm not going into a whole lot of detail because I can just link you to a 2006 weblog entry that reads almost exactly like the Future Stuff entry. Nissan is still working on this system; no one else seems to be interested. Today, the only presets in most cars are for the radio, but there are some cars with "memory seats" and "memory mirrors". I wrote a story about this in 2004. But Future Stuff knows about your puny memory seats, and claims that this "goes far beyond the seating memory feature available on some of today's luxury sedans." The mirrors, safety belt shoulder strap, "brake and accelerator pedals" are also controlled by motors and will move to please you. It looks like the mirrors are the only parts of the car that got memory since 1989. "The Driver Personality Key is also a built-in security system. When it is removed, the vehicle is automatically disabled... the computer, which controls all electronic functions, cannot be activated without the key." There are, indeed, now electronic keys that don't do much besides activate the car's computer. "Video display route charting is here, in the form of the Etak Navigator, the first of a new generation of 'smart maps'." Here's how it works, see: "the Etak Corporation, of Santa Clara, California", digitizes all these road maps and puts them on cassette tapes. You attach motion sensors and a compass to your car. Give it an initial location and it can tell where you're going. So long as your car never engages in large-scale quantum tunnelling, then, the system will always know when your car is. This has obvious similarities to the GPS-based navigation aids that are somewhat common in today's cars (but see the next entry, which is exactly that). It's clunky, but the clunkiest part isn't the lack of GPS: it's those cassette tapes! Like the Smart TV, it's an idea ahead of its time, waiting for the day when mass storage is cheap plentiful, and random-access. ("Also available soon will be navigational systems based on compact disc storage systems.") Here's a listserv message reminiscing about the system, which does seem to have been produced and sold, though probably not in great numbers. The price given is $3500/1980s, significantly higher than the Future Stuff promise. Etak is the hot potato of in-car navigation systems. News Corp bought it in 1989, Sony bought it in 1996 from News Corp, and finally in 2000 Tele Atlas bought it from Sony. Not too surprising, since Etak held a lot of patents and was clearly on to something big, but equally clearly went through a multi-decade rough patch where the underlying technology was not able to fulfill the promise. According to Wikipedia, Etak's initial funding came from Nolan Bushnell. There's quite a lot at Wikipedia, in fact, and it's well-sourced. Though a big chunk of it comes unattributed from that listserv message I linked to. Check, ah say, check out that graphic. That's the future right there. Knobs and buttons and little display screens. It's probably a sign of how slowly car design changes that that device wouldn't look out of place in today's cars. The most recent GPS navigation devices for cars use touch screens (cost: $200-$300/2008), but an older crop looked pretty much like Nissan's prototype Satellite Drive. 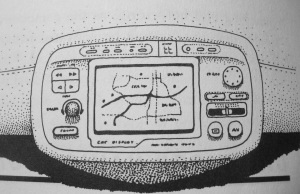 In 1989, though, GPS a ways off from use in consumer products. Future Stuff describes "Nissan's Global Positioning System," "an amazing system that will be able to pinpoint your car's location anyplace in the world." Future Stuff goes on to dis its own previous entry, saying Car Video Navigation System's motion sensors "should be passé by the end of the decade" and directing you to "[f]orget video road maps and memory banks"; apparently "[t]he picture on your screen will be the real thing transmitted via satellite." They do go overboard, what with promising real-time satellite footage and a system that "alert[s] you to an upcoming traffic jam... warn[s] you of approaching bad weather, and so on." Look closely and, while still impressive, this entry is kind of a mess. Future Stuff uses the phrase "Global Positioning System", which is the name of a specific system that was being built in the 80s, but they attribute the whole system to Nissan. That's just a mistake, but it indicates that the authors got most of their information from Nissan. Traffic, weather, and real-time imagery can all come from satellites, but GPS don't play that. And that data would probably cost money by subscription (the way satellite radio does today), whereas GPS was a free service provided by the US government. Note that the estimated price, while high, is a flat price. And real-time satellite imagery is a pipe dream, especially considering the high price of the Spy-Satellite Photos we saw 70 pages ago. So, if I may present a grand unified theory of What's Up With That, the Future Stuff authors talked with Nissan, who told them about this Global Positioning System thing. Now, the Nissan engineers know what's up, they know a GPS satellite is just a beacon with a clock, but the FS authors aren't talking to an engineer. They're talking to a PR flack, possibly through a language barrier. And somehow one or the other side introduces into the conversation all the other neat data you can get from "satellites". Anyway, the whole thing is kind of moot because now you can indeed get weather and traffic from subscription service, broadcast over satellite radio or the FM Radio Data System, and integrated with your car navigation GPS system. So all the stuff about Nissan owning the GPS system and where the weather data comes from is kind of nitpicky; almost everything in this entry came true. I would like to restate my argument, though, that the real breakthrough for this product was not the GPS system itself, but the availability of cheap storage for all that map data. GPS is really cool, but motion sensors on the car would have worked fine. Cost "Out of this world"
"Turbine engines are coming to cars. That was the word from Chrysler Corporation twenty-five years ago." At last, a taste of old-school futurology. For all I rag on Future Stuff, it's much more accurate than most other books of predictions. It deals with consumer products rather than societal trends, and it's based mostly on talks with small, cutting-edge companies rather than huge companies that have a budget for "innovation." But here we're talking about Chrysler, and turbine engines are one of those innovation line-items. Turbine engines have fewer parts and last longer. But the high cost of the materials makes them impractical for "a family car". This page on Chrysler's long history with turbine engines suggests that the company gave up on the idea in 1979, but Future Stuff found someone willing to gamble on "a revolutionary breakthrough in ceramics and other high-temperature materials" which would make turbine engines feasible. There seems to be a contigent of car nuts that's really excited about turbine engines for no reason I can discern. I freely admit that I am excited about lots of ideas that car nuts probably find very boring. And certainly the fact that a feature hasn't gotten into a car fifty years after the initial idea doesn't mean that it's a bad idea. Car companies are conservative and make lots of stupid decisions. But this really looks like inappropriate technology for a car. Ah, dammit. This is the same as The Noice Canceler. Except inside the car, and aiming to cut out "whistles and drones" rather than engine noise. British automaker Lotus is pioneering adaptive noise control, a 90s term for noise cancellation. Lotus did end up selling this system to other manufacturers, but it didn't get many takers, and you don't really hear about noise cancellation in cars anymore. Now that I think of it, though, you often hear cars advertised has providing "quiet rides", and it's never specified whether the ride is quiet because the car is quiet, or because there's noice-cancellation gear inside the car. This is a product called "entireControl" made by a company called "techni Guidance", the e. e. cummings of the auto industry. Sensors in your tires monitor tire pressure and flash a "CHECK TIRE" warning if the pressure gets too low. But wait! There's more! "By means of a reservoir mounted on the wheel rim, carbon dioxide can be added to the tire." The result is "better road handling, improved fuel economy, and peace of mind." Here's the patent, filed by inventor Shrikant Gandhi. Gandhi went on to start Kisan Technologies, which made "safety devices for motorcycles". There are tire pressure monitors on the market today, but I couldn't find any that would maintain tire pressure. I hope I've been able to conceal how BORING I find this topic. I'm guessing that price is the price of the engine, not a whole "vehicle". It's GM's turn to trot out their innovation line-items, and they've got a Chevy Corsica that can burn either "gasoline or methanol... [f]uture models may be able to burn other alchohol blends, or even propane." You don't see these much in the US, but a Brazilian friend recently told me that Brazil has pretty a popular line of "flex-fuel" cars that will run on gas or ethanol. However I'm coming to the conclusion that ethanol is not a good long-term solution unless we can get it from algae or something. Of course in 1989 they were worried more about the supply of burnable carbon and less about the climate change caused by burning carbon. Heads up, Poindexter! You're probably familiar with heads-up displays from video games, and you may have seen it in concept cars—I remember seeing something in some bit of Newsweek futurism in the late 90s. You probably haven't seen it in real cars. HUD-in-car is like the videophone: it works fine, and once in a while they try to push it on people, but nobody wants it except a few nerds. If you doubt me, here are some sample nerds debating the merits. I don't know if this is a mistake or just a really weird prototype, but Future Stuff has the HUD image projected "8 feet ahead of the vehicle into the driver's field of vision." Surely it's projected onto the windshield like all other vehicle HUD systems, and merely appears to be 8 feet ahead of the vehicle? We may never know. Uniroyal Goodrich came up with this car tire made of polyurethane elastomer, a "rubber-like material" used to make the wheels of "shopping carts, skateboards, roller coasters, and heavy trash containers". That's according to the Center for the Polyurethane Industry, "formerly the Alliance for the Polyurethane Industry". (See, the Alliance for the Polyurethane Industry got run out of town on a rail, and had to sneak back in with a new name.) It can't go flat because it's not inflated in the first place. It's solid tire, baby. Here's a pay-for-more teaser for a 1987 Chicago Sun-Times article about Uniroyal Goodrich's project. "Uniroyal Goodrich has yet to choose a production site," and it looks like they never did. There are solid tires in use today, but they're mostly used in shopping carts, skateboards, etc., not in cars. Design Tech International, the company with a name so generic I felt like they'd already shown up in Future Stuff, has come up with this odd little device that starts your car before you get in. "[A] touch of the transmittor button on your keychain will turn on your engine, as well as the heater, defroster, windshield wipers—and in summer, the air conditioner." It takes the form of a box with lots of sensor hookups. Something like a modern computer's CPU case with integrated USB, sound, power control, and so on, each of which has a little plug on a wire that goes into a standard slot on the motherboard. There are lots of edge-case features like timeouts, engine cutoff if someone gets to your car before you do and tries to make off with it. Unlike most of our generic-name champions, Design Tech is still in business, wasn't bought out by another company, and still sells the product mentioned in Future Stuff. They sell DIY remote-control starters for $80-$200/2008, and they've got some competition in the form of Canada's Autostart. Most new cars made today have a remote that unlocks the car so you don't have to fumble with keys, but I don't think the whole car-startup thing has ever been included in cars. Which is a shame because if you built it into the car you might come up with a way to just start the heater and defroster, instead of starting up the whole engine. Or maybe I know nothing about cars. "The idea of car windows which adjust their tint to the brightness level outside seems straightforward enough: after all, haven't those eyeglasses been available for years?" I'll do the future audit around here, thank you very much. Ford's Glass Division (of course they'd have a Glass Division) has invented Switchable Privacy Glass, which uses "LCD technology... adjusts the transparency of the glass from fully transparent to nearly opaque..."
Dammit. This is the same as Privacy Windows! Curse you, Charles M. Jordan, with your "It's likely that the whole upper part of the car will be glass"! None of this happened except in ambulances because it's too expensive, just like I said almost a year ago! What's wrong with this chapter? It's just rehashing stuff from previous chapters and adding "...in cars!" like a Gary Numan song! Vision... fading...! cheap cop-out device for ending entry... ending entry...! I think this is the best joke in Future Stuff: "Before too long, cars will be coming with no springs attached. Shocked? don't be, because cars won't have any shocks either!" It's "active suspension", a system of hydraulics that cancels out potholes and other signs of our nation's crumbling infrastructure. "The driver can program this system for a ride that's 'soft,' yet still as responsive as a sports car." This is another product of the minds at Lotus, a car company I'd never heard of until starting this section. "Active suspension" is now a term of art in the auto industry, and if you like expensive cars, take heart, because that's the kind of car that has it. In 1989 it was only used in "Grand Prix racing cars", so maybe there's still hope that "someday you'll have an active suspension in your car." I was walking around town thinking about this entry, not having read anything but the title, and decided that the big advantage of a plastic motor would be price. Plastic's cheap, right? But this engine would have cost more than a regular engine. The advantage, it turns out, is weight. "The major car manufacturers have already seen running prototypes of plastic engines..." Here's a NYT article from 1982 about one of those prototypes, a Ford venture with Polimotor. Polimotor was owned by Matty Holtzberg, described in Future Stuff as the inventor of the plastic engine. Here are Holtzberg's patents. There's an engine block from 1988, and I guess the patents from 1982 are for engine parts. Poking around on the web I hear reports that one of his plastic engines made it into a racecar, and I don't see any reason why this shouldn't work, but it's not in cars today. Plastic engines are, however, sometimes used in light planes, where weight is very important. "This bit of useful technology will come to us care of the military." Well, that part was certainly right. Today you can get night vision goggles from $15/2008 (kid's toy) to $200/2008 (entry-level monocular) to $10,000 (full kit with zoom lens etc.). But apart from some boastful nerds on Digg threads (see Heads Up Display passim) there are few people who have used it as part of a heads-up driving display. This technology did make it to the 2000 Cadillac DeVille, so it's a kind of predictive hit we're used to seeing: the thing that arrived more or less on schedule but nobody bought it. Pre-Gulf-War-I Future Stuff explains how infrared sensors work, but you probably know that stuff already. Ah, this is great: "GM has a prototype infrared night-vision system, but it's large and must be mounted on the car's roof. Furthermore, the infrared receiver requires cooling by liquid nitrogen." Yes! Liquid nitrogen on top of your car! Thankfully, in the 2000 DeVille they just needed a heat sink. There are still lots of patents being issued to various car companies for refinements to night-vision heads-up displays (example), so this isn't something they're going to let go of. I'm sure come another twenty years we'll see in the infrared all the time and there will be no real difference between night and day. Look, I've tried to be a good sport about all this car stuff. But two-cycle engine versus the standard four-cycle model? This is like 1800s stuff for me. Even the plastic engine was cooler than this, though its benefits were the same: "fewer pieces inside... lighter, too..." Unlike the plastic engine, the two-cycle engine is also cheaper than a traditional engine. This particular engine is made by Australia's Orbital Engine Company; it weighs 90 pounds and "can better the output of four-cycle engines even though it is one-third the weight." Near as I can tell, two-stroke engines are still rare; they show up in boats, and in small motorized appliances like lawnmowers. Here's a 2006 article about a New Zealand company with their own two-stroke engine. In the comments for that article you can see the sort of people who might be able to make this entry interesting. "Sure, four-wheel steering is already here. But so far it's a flashy novelty on sports models rather than an important safety and driving feature. By the mid-nineties, four-wheel steering should be as common as front-wheel drive." Argh! The one time in the book they decided to look at the implications of an existing technology becoming much more common, and it was four-wheel steering! What good is four-wheel steering, I ask? "The strength of four-wheel steering is maneuverability... it makes a huge difference when you're trying to park your car in a tight space. At high speeds, four-wheel steering greatly improves stability..." Huh? Sorry, I was reading another book. A book that promises rocket cars, and hotels on the moon! Four-wheel steering did make it to some cars (the vast majority being Japanese imports) in the 90s and early 2000s, but it never really caught on. Drive-by-wire is a way of taking the mechanical controls that connect your instruments of car control (steering wheel etc.) with the things they control (axles etc. ), and replacing them with electronic sensors. It "sounds scary", but "airplanes have been flying by wire for quite some time." And solid-state electronics are usually more reliable than "heavy mechanical links". But drive-by-wire remains controversial; it's part of the reason the Collision-Avoidance System (see above) hasn't caught on. Best I can figure, car nerds don't like it when you take part of the car they can fiddle with and replace it with an electronic black box. And they have a point, but that ship (car) has sailed (driven away), my friend. That ship (car) has sailed (driven away). The Toyota Prius uses drive-by-wire, but it's still too expensive and/or controversial for mass adoption. The most obvious post-Future Stuff development in drive-by-wire is the DARPA Grand Challenge (probably not going to be the Intergrandchallenge anytime soon), a competition to devise AI systems that can drive cars autonomously. "Maybe you've seen this TV-monitor system on those small airport buses that take you to your rent-a-car." Or, maybe, an actual bus taking you somewhere, rather than you flying there and then renting a car. There's a video camera on the tail end of the bus, which transmits to a screen on the dashboard, giving the driver a "clear, wide view with no blind spots". This is Sony Security Systems's (yes, part of the real Sony) Automotive WatchCam, sold in 1989 "only to the truck, bus, boat and recreational-vehicle industries." "[A]utomobiles have only a small blind spot," but with tendentious logic, sales and marketing director William Yan argues that getting rid of the small blind spot with a video camera and monitor makes for "a viable poduct for car drivers... it will 'instill confidence in drivers.'" Of course, since Future Stuff cars have gotten a lot bigger, thanks to loopholes in classification rules. Today's SUVs have bigger blind spots than your 1989 station wagon, and there's correspondingly more need for bus-style rear view monitors. I don't think they come standard with the cars, but they're available for $60-$140/2007. Here's a 2007 PC World Review of Roadmaster's VR3 Wireless Backup Camera. The verdict: "even though it was a pain to install, I'm glad I have it." This document (source) is part of Crummy, the webspace of Leonard Richardson (contact information). It was last modified on Monday, March 31 2008, 00:26:31 Nowhere Standard Time and last built on Friday, April 26 2019, 00:00:24 Nowhere Standard Time.